Before the 16th century, in the bay of Villefranche, a few kilometers east of Nice (France), the Savoia funded an important naval base: shipyards, a fortress, the harbor, a dry dock, army barracks, a hospital and cemeteries. While the safe moorings protected the fleet from all winds, on land the galleys - that allowed Vittorio Amedeo II to control the commercial routes of the northern Mediterrenean Sea - were being built and repaired. Today the site is still very well preserved. Outside its "magic" perimeter the area is fraught with tourists and high buildings, the cruise ships in the bay pour over thousands of people through the maritime station, and even though the frigates were replaced by elegant Swans or powerful Mangustas here time stopped. 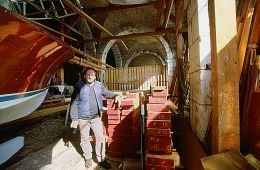 In one of these fortresses, where the Piedmontese kept their ships' oars, masts and weapons, for years Gilbert Pasqui has been carrying out the job inherited by his father Mario: the repairing, building and refitting of wooden boats. A few months ago he celebrated the 40th year of activity with a big party and an informal regatta with his clients' as well as friends' boats: Tuiga, Moonbeam IV, Lelantina, Keep Trust, Eilidh and ten other boats of the same type and importance. Even though Gilbert operates on all parts of the hull, his "specialization" is the construction of the spar: masts, gaffs, bowsprits, booms and spinnaker poles. Many vintage boats, with broken masts for having dared too much in strong winds or simply because old and worn had them built here: Zaca a Te Moana, the big schooner Moonbeam III, a Fife 15-meter International Rule design, Varuna, Havsörnen, Halloween, Emilia, etc. The other part of this story starts in Gosport, facing the Isle of Wight, where in 1903 M.T.Hardcastle ordered Camper & Nicholson to build a hull capable of racing against and possibly winning over the most titled boats of the "aristocracy" of the sailing world of those times: Lulworth, Creole, White Heather, Valdora and the royal yacht Britannia. Not only must the yacht be very seaworthy, fast and sturdy but she must also be capable of supporting the maximum possible sail area even in strong winds. Merrymaid, the boat in question, was launched on April 30th 1904. Back then, the boat was not very innovative but she was quite modern, with a light displacement of 80 tons for a 30-meter LOA. She sailed and won, fully meeting the expectations of those times. Then, passing from one Owner to the next and alternating bad and good times, she was modified from cutter to square sail ketch, and then, in 1920, into cutter again with an enormous Marconi mainsail, becoming the first British yacht with a rig of this type. In the postwar period, Merrymaid was laid up, as most big yachts, on the Blackwater River in Essex, luckily avoiding demolition and sacking, until she was bought by her present Owner who decided to restore her. The person in charge of this operation is Philip Lechevalier, manager and captain for many years of Moonbeam III. Merrymaid was taken to Seine sur Mer, in the bay of Toulon, to the IMS yard where, every single piece was rebuilt in compliance with the 1904 design according to the original plans obtained from the Greenwhich Maritime Museum. Twenty percent of the teak planking was replaced, some floor timbers were made in galvanized steel, and the deck was totally rebuilt as well as half of the superstructure, interiors and rudder. The keel, frames, stempost and sternpost were in excellent preservation state. As for the rigging, only the specialized yard of Villefranche could have been chosen, where, last spring, wood planks were heaped up under its stone vaults. The type of wooden mast is chosen on the basis of several considerations the first one being the type of rigging - fore-and- aft or square - and the performances required. As for the latter, the yard must refer to the original specifications considering speed as well as safe sailing conditions. Given the fact that such an investment should permit to sail over a long period rather than to save ten seconds over Britannia, the rigging must be sturdy as well as light. As for the type of wood to use there is just one possibility: the gaff rig includes the lower mast for the mainsail and a separated top mast, fixed with fittings to the lower one, to support the gaff topsail with relative gaffs. The wood of the lower mast, that supports the sail and the shrouds, must be resistant to twisting and compression: the first and only set of spreaders is near the top of the mast, because as the top mast is not structural and the mainsail is hoisted with grommets, the whole set must be absolutely rigid. The drawings show the difference between the section of a square-rig mast (n.1) and of a Bermudan or Marconi one (n.2). In the latter, by virtue of the different sets of spreaders conceived to offer rigidity as well as flexibility, accompanying the profile of the sail, the wood thickness is smaller thus the mast weighs less. In this case the preferred wood is the precious Sitka spruce, which is light and extremely resistant to flexibility. On the contrary, the section of a square-rigged mast is thicker and the inner cavity is smaller: in this case the preferred tree species is the Douglas fir, Pseudotsuga douglasii, "pin d'Oregon" for the French. We asked Giovanni Magnino, owner of the Magnino Legnami of Alessandria (Piedmont, Italy) and supplier of most shipyards, among which Gilbert Pasqui's, about these essential raw materials "...the Douglas fir and the spruce that I supplied for Merrymaid come from British Columbia, where I personally chose the plants, and were naturally let to season here for at least five-six years, as all our timber. They are classed by the relative American Agency as "Spar and Mast", this means they are suitable for the construction of spars and masts. 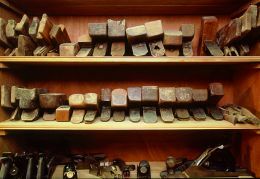 This also means that they own a high density of growth rings and a very regular tissue, characteristics that guarantee high and homogeneous performances. 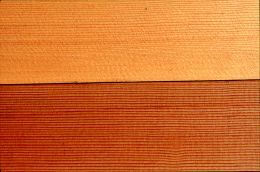 The weight of the seasoned Douglas fir is approximately 530 kg/cu.m and the humidity at which it should be planed is approx. 12%. The same is true for the Sitka spruce, which is much lighter, approx. 430 kg/cu.m, and much more expensive than the Douglas fir, whose characteristics are such that is could be used for helicopter propeller blades". 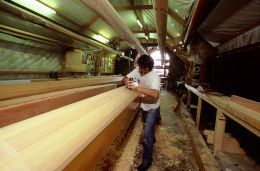 Therefore, Merrymaid will have bowsprit and lower mast in Douglas fir, which is a rigid and self- supporting wood; top mast, mainsail and topsail gaffs, boom and spinnaker pole will be in Sitka Spruce, Picea sitchensis, which is a lighter and more flexible wood. The building procedure is the same, independently of the wood: radially-cut and glued planks with the vein set in the direction of greater effort. Magnino again explains the genesis of the glues they use: ".after the casein glues of animal origin, produced at the beginning of the 1900's, the resorcinol-based glues appeared, having a very good hold yet their application in exposed work was limited by the fact that they are dark red, while the two-component epoxy resins, originating from the so-called "acid" glues, typical of the 1950's and 1960's, showed to have an incredible hold when used on well seasoned woods and are transparent." Clamps pressing glued strips are a constant panorama inside the yard. After a few days at a temperature between 20 and 30°C for an ideal catalysis, the clamps are removed and the planing job starts at the end of which the mast will be round shaped. 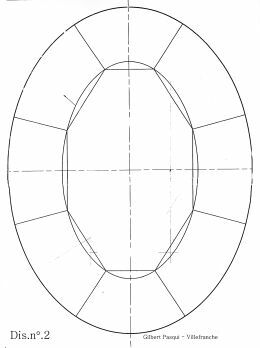 This is obtained by means of a sequence of passages through ever-more complex polygons until a 420mm-diameter circle is obtained as indicated in the plans. Just the 3.3-meter section between the keelson and the deck will maintain the octagonal shape; the inner cavity stops half meter from the mast heel, which is in solid wood. 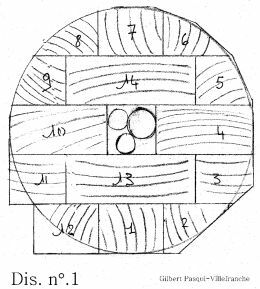 The planing, first done with electrical instruments and then with the hand plane ("rabot" in French), is an attribute of Gilbert or of his right hand, Salvatore, for it is too delicate a task to be entrusted to the light-hearted intepretations of the apprentices: one too vigorous paring off and the mast shape becomes sinusoidal! At the most, the youngsters carry out the sand papering, initially made manually with long strips of abrasive paper, from thicker to ever more thinner grain, and then with the lapping machine. 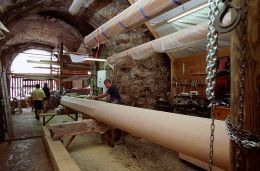 I ask Pasqui the weight of this mast"...1,800 kilograms before planing, that is all the fourteen glued wooden strips for a total length of 22,40 meters. 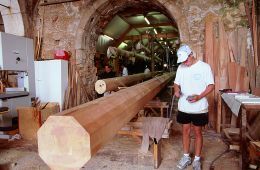 When completed it will weigh 1,300 kilos, to which the 12.4-meter long small spruce mast will be added..." He cannot finish the sentence for a group of loud students enters the yard, excited in discovering how these enormous masts are obtained from trees... 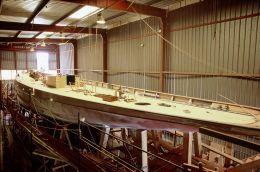 Even though the weights seem exaggerated, they make sense if one looks at the Merrymaid hull and at its 31,000 kilos of lead used for the boat's righting moment, as we did a few days later, in the IMS yard of Seine sur Mer. In the meanders of Villefranche it is now time for the hardware to be fitted. Gunter iron, spreader fittings, shrouds, connections, etc., are all in galvanized steel and must be adapted, drilled and joined before varnishing. Fourteen coats of varnish are laid, one per day, allowing twenty-four hours between two successive coats for drying and sanding. The spar will then reach, via land or maybe sea, the bay of Toulon to be fitted with boat afloat. This time we miss the show - a true thump for boat owners - of the expensive hand-made mast launched in the sea directly from Pasqui's yard and towed in the water to the "Darse" crane: this is a privilege that only some very long masts have!